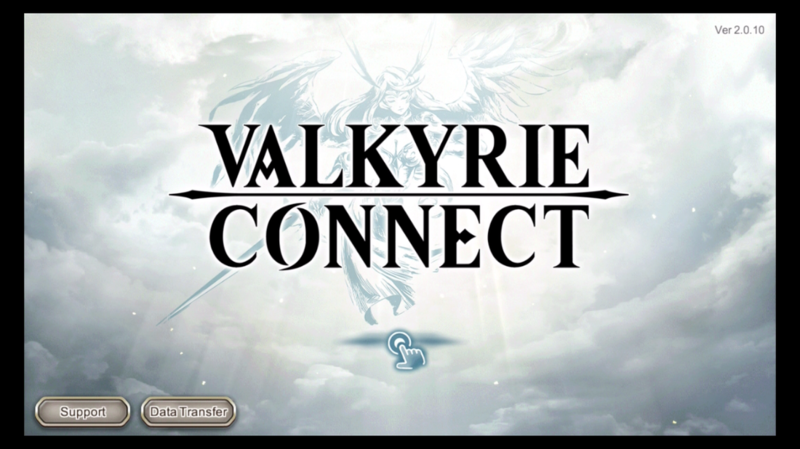 When I first saw Valkyrie Connect, I wasn't very interested in it. It is very similar to some other free-to-play mobile games that I play, and I was looking for something different. However, my brother convinced me to give the game a try, and while the base game plays like other games I currently play, there are enough unique features to this game that makes me come back each day to play it. However, with it being free-to-play, this game does suffer some of the same pitfalls that games like it always seem to fall into. The story in Valkyrie Connect revolves around you, a chosen human with unique power, being tasked with having to prevent Ragnarok from destroying the world. On your journey, you are joined by Skuld, a Valkyrie from Asgard, and Hel, ruler of the underworld. Along the way, you will come across many different characters, almost all of which can become playable. The game does pull from a lot of Norse mythology, so Odin, Freya, and many others are used as heroes in this game. You also come across elves, dwarves, humans, and beasts. Overall, the story isn’t the greatest, but it is interesting enough. Combat revolves around forming a team of five heroes to fight your enemies. Combat is automatic such that you do not have any control over when or which heroes auto-attack. However, taking and doing damage does fill up a special attack meter for each hero that can be activated when full to do that hero’s special attack. There is also a limit break meter that fills up and can be activated to let one of your heroes do an ultimate attack that can usually turn the tide of a battle. Combat in this game is not complex, but there is some strategy required at the later stages in the game. The game has two main forms of currency, which are mana and diamonds. Mana is the base currency and is used for pretty much all basic functions in the game, many of which I will go into detail later on in this review. Diamonds are the premium currency in the game, and while they can be acquired in the game, the fastest way to get them is to spend real-world money. There are also some other specific currency tokens attached to different activities that I will discuss later in the review. Stamina is this game's way of blocking progression, or at least slowing it down. Stamina is used for all quests and encounters except Arena content. More stamina is required as the content gets harder. You gain 1 stamina every three minutes until you hit your cap for your player level. However, you can also earn stamina from daily quest rewards, special events, and for free twice a day. Stamina can be stockpiled up to a hard cap of 1,500. You can also buy stamina with diamonds. Being a free-to-play game, there is a shop where you can spend real money on diamonds. Overall, the prices are reasonable, and they do run specials on certain bundles, which tend to be good values. This game does have a daily login reward, and they are often adding in extras to the sign-ins. If you put the time into the game, you really do not need to spend money to have fun with it. Heroes are a huge part of the game, and you will be focusing on making them as strong as powerful. There are three different types of heroes in the game: melee, magic and ranged. All heroes start as a 1, 2, or 3 star hero. A hero’s power increases with their star rating. All heroes can be upgraded to 5 stars by earning hero souls. Hero Souls are gained a few different ways, such as hero quests, traders, or summons. One thing to note is that while all heroes can be upgraded to 5 stars eventually, usually the ones that start out as 3 stars tend to end up being the better ones overall, with some exceptions. Hero level is another way to make your heroes stronger. Heroes gain experience when performing missions in the game or by spending mana. When heroes level up, their base stats increase. A hero level can not be higher than whatever the player’s level currently is. A good rule of thumb is that the player gains experience from almost everything a hero will gain experience from. While you can level your heroes doing missions, it is faster to use mana to level them up. Keep in mind that this can get costly in later stages of the game. Orbs are used to make your heroes stronger. Each hero starts at grey power level, regardless of what their star rating is. Each hero has six orb spots per power level that need to be filled in to progress to the next level, and these orbs themselves also add more power to your hero by increasing its health, strength, etc. Once you fill all six orbs slots, you can absorb them to increase your hero’s overall power, and a new set of orb requirements appear for that hero to fill. After doing this a set amount of times, your hero will advance to the next color power level, such as from grey to green or green to blue. While this does become very time-consuming later on, it provides even more power gains than at the lower levels. Probably the biggest thing from doing this, though, is that when your power color changes, you unlock new gear slots for that hero. Gear is one huge way to make a hero stronger. While the stat increases may not seem that great, most pieces of gear have an ability that is used in combat. At first, a hero can only equip one weapon/armor and an accessory, but as their color power grows, they unlock more gear slots up to a maximum of 4 weapon/armor spots and 4 accessory spots at purple level. Also, some gear is restricted to role/race, and other gear pieces are designed for only one specific hero. I'll talk more about gear when I get to the Blacksmith. 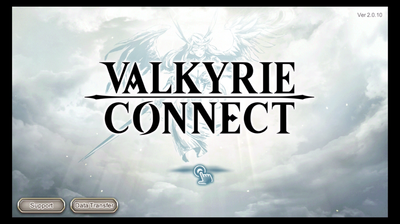 The main campaign tells the story of Valkyrie Connect through battles and story scenes. The campaign has some missions that are once-and-done and others that can be repeated. These mission reward mana, orbs, hero experience, and player experience. The repeatable missions are used to farm orbs for your heroes and are often your best way to get them. The story scenes give you diamonds, although they can be optionally skipped through. Also, hitting certain milestones in each chapter will give you diamonds as well. Hero Quests are one of my favorite features in the game. Every hero in the game has a small story that you can go through, and it gives you a little more background on the hero. When going through these quests, you will get mana, orbs, and diamonds. The real goal is getting to and completing the last mission for the hero to get their hero souls as rewards, which is the best way to get them for any particular hero. This mission, along with any other repeatable mission that shows up for that hero, can be done three times a day. While you will go some days and get nothing, I've had days where all three runs yielded the hero’s soul. The best thing with hero quests is that you only need to get one hero soul for that hero to do it, so you can eventually unlock the hero just by having one of their souls. Connect battles are a staple of Valkyrie Connect, and they involve you fighting a huge monster using a team of five heroes with up to two other player teams. There are 6 difficulty levels for each connect, with the harder ones opening up based on your player level. Completing a connect battle gets you generic connect tokens every connect battle and boss-specific tokens that are only obtainable from that specific boss. 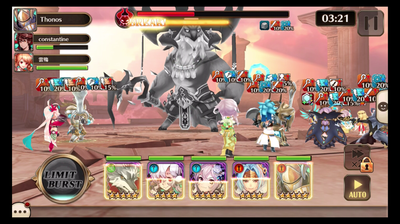 There are two ways of participating in a connect battle: creating a battle yourself or joining another player’s battle. Creating your own battle and succeeding in beating the boss gives you more tokens plus a chance of getting a hero soul for that boss. Joining another player's connect battle and winning gives you tokens but no chance of a hero soul. The player that creates the connect battle has to use stamina to do it while joining a connect battle costs nothing. The higher difficulties require more stamina to start the battle. In either case, if your team gets beaten during the fight, you get nothing, but if the 5 minute timer runs out instead and the boss still isn’t defeated, you at least get a few tokens. Tokens can be used at the trader to buy certain gear and hero souls. The connect boss changes every week, but it does seem that they come back around again eventually in the rotation. There is also an event called Valhalla Onslaught. The goal during this event is to progress through at least 10 floors, with there being 10 battles per floor. Each battle has you going up against a different player’s team of ever increasing difficulty, although the enemy team is controlled by AI. Progressing through each battle and floor leads you to chests that have Onslaught tokens and sometimes gear in them. One thing to note is that hero health and special meters are do not reset in between fights, and any hero that dies during a fight remains dead. However, there is a 10-hour cooldown that revives heroes, restores their health, and maximizes each of their hero limits as well as the party’s limit burst. Diamonds can be used to immediately reset the cooldown and open any chests you get after fighting, but this cost goes down over time until they are free. This event is alright, but the upper floors can be brutal. There are also daily quests that give either hero experience or orbs. There are three difficulties for each one, and only certain types of heroes are allowed to be used each day, depending on which day of the week it is. The experience quests give out a decent amount of experience compared to the amount of stamina required to do them. The orb quests are a good way to stock up on lower level orbs to power up your heroes, although the best time to do them is when there’s an event going on that gives additional orb drops. The option to use these quests are here if you want to use them, although using mana is a faster route as long as you’re willing to incur the mana cost. Besides connect battles, the Arena is the other end-game content right now. Here you pick a team of five heroes to fight other players’ teams. Combat is automatically handled by the game, and you have no control over the battle. If you beat your opponent and they are a higher rank, you take their spot, and if that is higher than your previous best rank, you get mana and diamonds. The amount of diamonds and mana that you get per improved rank number goes up as your rank approaches one. Likewise, if an enemy player defeats you and you were a higher rank, they take your spot and you fall down to their rank. Your rank will also earn you a certain amount of arena tokens per hour that can be used to buy certain hero souls and gear from the trader. Also, you get a certain amount of diamonds daily based on your ranking. 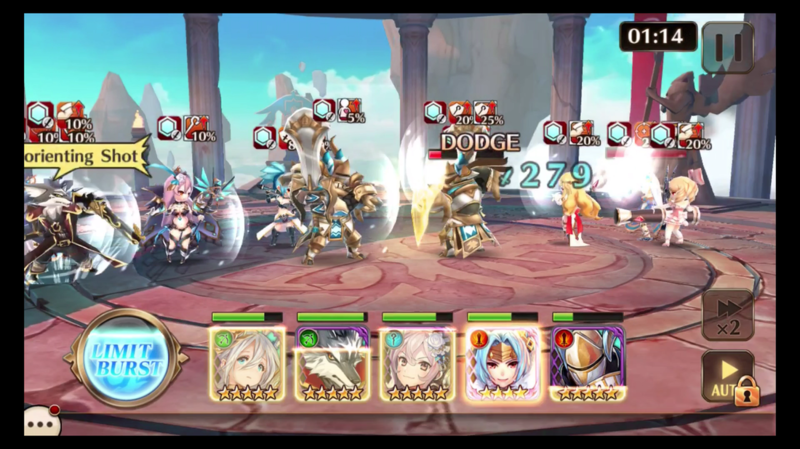 The Grand Arena is where you take three five-hero teams and go against another player’s three five-hero teams in a best of two-out-of-three matches. Like the Arena, winning against a higher-ranked player lets you swap ranks with them and rewards you with mana and diamonds if you beat your previous best rank, with the rewards being according to how many ranks you’ve improved. You also earn arena tokens per hour based on your rank, and you also get diamonds daily based on your ranking. Besides the 10 minute wait between battles, there is no limit to how many Arena and Grand Arena battles you can do in a day. While hero level and power play a factor in these battles, having the right gear becomes very important. Also, certain heroes are very useful for these arena battles. This becomes a problem since you start seeing the same hero teams over and over again due to how good some heroes are for arenas. This is less of a problem in Grand Arenas, but if you do not get certain heroes, it might feel like you are going to fall behind in the rankings against some other more PvP-favored team compositions. The Blacksmith lets you upgrade your gear. 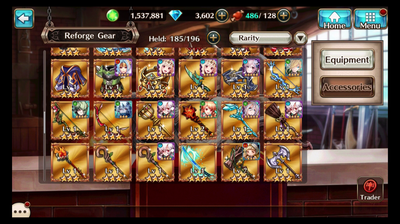 Gear in this game has a star rating of 1 to 5, like with the heroes. Combining two of the same items of the same star level will increase the first item's star level while destroying the other one. Each piece of gear also has a level that can be increased by using other items to level it up. The maximum level of the item is determined by the item's star level. Along with the items, mana is also consumed when either leveling up the gear or improving its star rating. Some gear also have abilities that can be leveled up by consuming either gear pieces with the same skill or skill rune gear, which are designed for that purpose. Any gear that is not wanted can be sold for blacksmith tokens, which in-turn are used to buy other gear at the trader. Gear becomes very important later in the game, so getting the right gear for the right character and leveling it up becomes a top priority. Summons in Valkyrie Connect are one way to get gear and hero stones. The most common summon is a mana summon, which can be done for free five times daily and 10,000 mana for each additional summon, and they reward either one-star or two-star gear or hero souls. 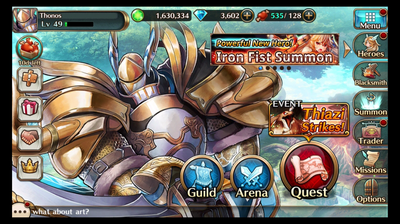 Diamond summons yield either two-star or three-star gear and hero souls, and you get one free summon on a 28-hour cooldown and 300 diamonds for each additional summon. Both also offer a 10-summon pull for a higher cost, with the diamond one guaranteeing at least one hero. These two types of summons are going to be your most common way of getting gear for upgrading and getting hero stones for lower-level heroes. 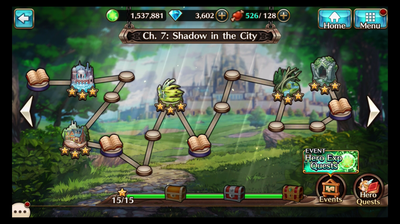 Besides mana and diamond summons, the game offers many other summons, depending on the time of the year or if the developers feel like including a random one. These summons sometimes offer gear or heroes that are exclusive to that summon type. These summons always require diamonds and can vary in cost for the type of summon. Sometimes these summons will guarantee a hero after a certain number of pulls (e.g. back in January, there was a summon that guaranteed that you would get the new featured hero on the third pull, which in that situation cost 4500 diamonds). That is one thing I really like about this game, where you can save your diamonds for a summon that guarantees you a hero that you want instead of hoping you eventually get the hero that you want from a pull. The game has a system where you can offer two heroes at a time as mercenaries. These heroes can be used in campaign battles by other players. Hiring a hero costs nothing and gets the player owning the hero some friend tokens. The heroes that are selected as mercenaries also gain friend tokens over time for just being offered. These friend tokens can be used to buy items from the trader. This is a nice system that does come in handy if you run into troublesome missions during the campaign. There is a guild feature in the game that currently does not add much to the game. A guild can have up to 20 players, and everything that guild members do counts as guild experience. Your guild levels up once you gain enough experience, and increasing the guild level opens up some additional titles for guild members that can let them provide additional guild experience, but beyond that, the guild level means nothing. You also earn guild tokens that can be used to buy items from the guild trader. There are numerous types of tokens that you get from various activities in the game, as I’ve been mentioning. These tokens are used at the token-specific traders, along with the normal mana trader. The traders reset every couple of hours, and from the traders you can buy orbs, gear, hero souls, and mana. Most of these tokens are earned pretty easily, so if you see something that you like, don't hesitate to spend your tokens on it. I am a little more hesitant to spend any diamonds on hero souls from the trader due to their high cost. However, the option is there if you want to buy them. Almost everything that you can do in the game has a daily mission assigned to it. There are 36 daily missions in the game, and completing all of them will get you some diamonds. Each mission will either give you player experience, stamina, or guild tokens. It might sound like a lot of missions, but you can clear all of them with 15-20 minutes. The hardest part is waiting for and joining connect missions from other players, unless you create your own. The game looks good graphically. Each character has a portrait, which I think looks good, and each hero has a small 3-D model in combat, which looks alright. Stage backgrounds are a little bland but get the job done. Audio holds up pretty well, but it’s nothing outstanding. The heroes are all voiced in the game, but they only speak Japanese. One issue that this game suffers from is that with it being free-to-play, the paying people are almost always going to have an advantage. While it might not be as big of a deal as it is in other games like this, it still exists. Also, as I mentioned earlier, not getting the right heroes will put you at a disadvantage when it comes to the arenas. Finally, getting the correct gear, getting it to 5-star rating, and maxing its level is probably going to be the largest hurdle a lot of people are going to have. Overall, I enjoy Valkyrie Connect. It's not the most complex game to play, but there is enough here to keep me entertained. The developer seems to be regularly adding more events and things to do, which is something I like to see in a free-to-play game. Even at 20 minutes a day, I feel as if I can still stay competitive with other players. I hope to keep playing this game for the foreseeable future.